Hi everyone, I told you I'd be absent for a while, and yet here I am, writing again. Late yesterday evening, we completed the first part of our trip (the first 600 km), and arrived to Avellino, my husband's native town. Tomorrow morning we'll be sailing from Naples to Palermo, Sicily. So this is just a short stop. The scene that was waiting for us when we arrived yesterday, was a bit apocaliptic. I kept looking for Noa's Ark evrywhere, 'cause our car sailed rather then drove along the flooded streets, and when I stepped out of my car, my feet sank about 15 cm deep in water. It was pouring, no umbrella could hold the water, I was soaked when I finally entered the house. Luckily, all human (hmmm!!!) and animal species are safe and sound. I've mentioned several times already (and I'm getting boring, am I not?) my two zucchini plants. They gave me so many zucchini this year, that I felt like it was the only vegetable we've been eating for the past month or so. They grow so quickly that if I didn't check them for two days, on the third day they'd become really huge. Not to mention what I found after a 10-day trip to Croatia. My neighbour picked and stored for me 3 zucchini weighing about 500-600 g each. They were good but I didn't like them really prepared grilled or in any other way I normally prepare them (really, stuffing those giants wasn't really appealing, not to me). The second idea was to make a soup. Which I did, twice during the last week. My daughter won't eat vegetables. Which I hate. And to convince them to eat them, the only solution is to make a soup, but a creamy soup, 'cause if they see "live" vegetables in their plates they start throwing them out. 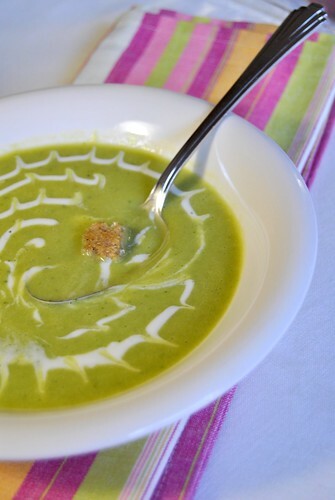 That's the reason why most of my soups are creamy, and I just realised they are almost all green as well. Adding some yogurt and not heavy cream to this soup resulted in a really refreshing dish, perfect for a summer dinner. Clean and cut the onion/shallot into large pieces. Cut the zucchini and the potatoes into cubes (make potato ones rather small so they can cook quickly). Sweat the onion in a pot with olive oil until it's translucent and develops nice smell. Add the zucchini, the potatoes and the peas (I used frozen baby peas). Saute on medium-low heat for 4-5 minutes, stirring often and then add the vegetable stock, cover and cook on the same heat for about 20-30 minutes, until the vegetables are tender. Pour evrything into a blender, add the basil and puree until you have a smooth cream. Add salt and pepper to your taste, a couple tablespoons of yogurt and blend shortly again. 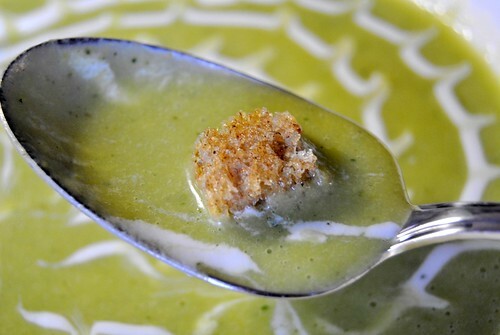 Serve the soup with more yogurt if desired and croutons. For croutons, cut the bread slices into small cubes and fry them with a tablespoon of olive oil in a skillet, stirring, until golden and crispy. I prepared them with my homemade wholewheat rye bread. La prima tappa verso le vacanze è completata, siamo sbarcati ad Avellino - avete letto bene, sbarcati, perché la situazione che abbiamo trovato ieri sera assomigliava un po’ fine del mondo, mancava solo l'Arca di Noè. La macchina navigava attraverso le strade allagate mentre continuava a piovere così forte che nonostante l’ombrello enorme che avevo in mano sono entrata in casa completamente inzuppata. Oggi un breve riposo, e domani ci imbarcheremo, stavolta per davvero, sulla nave Napoli – Palermo. Ma prima di ripartire, ho per voi una deliziosa crema di zucchine e yogurt, bella rinfrescante, leggera e gustosa. L’ho fatta con una zucchina gigantesca dal mio orto (che nella mia assenza ha raggiunto 600 g circa di peso). Pulite e tagliate la cipolla/scalogno in pezzi non troppo piccoli. Tagliate le zucchine e la patata in cubetti . Rosolate la cipolla in una pentola con l’olio EVO. Unite i dadini di zucchina, patata e piselli (ho usato quelli surgelati). Cuocete a fuoco medio basso per 4-5 minuti mescolando spesso. Aggiungete il brodo vegetale, coprite la pentola e lasciate cuocere per 20-30 minuti finché le verdure diventino tenere. Trasferite tutto nel bicchiere del frullatore, aggiungete il basilico e frullate fino a ottenere una crema liscia. Aggiustate di sale e pepe, unite un paio di cucchiai di yogurt e frullate di nuovo per pochi secondi. Distribuite la crema nei piatti, completando con un’altro po’ di yogurt e crostini di pane, se vi piace. Per i crostini, tagliate le fette di pane in cubetti piccoli e soffriggeteli in una padella con un cucchiaio di olio finché diventino croccanti e dorati. Io li ho preparati con il pane integrale di segale, fatto in casa, naturalmente. Kratki predah na putu prema Siciliji, trenutno smo u Avellinu, kod mojih svekra i svekrve, sutra bismo se trebali svi skupa ukrcati na brod za Palermo. Iako smo se sinoć po dolasku osjećali kao da smo sišli s broda, a ne iz auta. Toliko je padalo, kao da se doslovce nebo otvorilo, ulice potpuno poplavljene, auto se s teškoćom kretao, a po izlasku iz auta sam morala zaplivati. šalim se, plivala nisam, ali jesu mi noge do pola listova uronile u vodu. Danas je srećom bolje, čak je i sunce izašlo, kao da se ništa nije dogodilo. Ovu juhu sam pripremala dvaput prošli tjedan, jer se mojim curama, koje je inače više nego teško natjerati da jedu povrće, jako svidjela. Lagana je i osvježavajuća, ali prije svega ukusna. Za nju sam iskoristila ogromnu tikvicu iz mog vrta, koja je tijekom mog odsustva narasla do oko 600 g težine. Kako inače ne volim tako velike tikvice za druge pripreme, ova juhica mi se učinila idealno rješenje. Narežite luk na krupnije komade, a tikvice i krumpir na kockice. Popržite luk na ulju da malo zamiriše, a zatim dodajte ostalo povrće: tikvice, krumpir i grašak (ja sam koristila smrznuti). Dinstajte povrće miješajući 4-5 minuta, zalijte vrućim temeljcem, poklopite i kuhajte 20-30 minuta da povrće omekša. Uspite sve u uspravni mikser, dodajte 2 žličice nasjeckanog bosiljka i izmiksajte sve da dobijete glatku kremu. Dodajte jogurt i opet kratko izmiksajte. Dotjerajte okus, dodajte soli i papra po želji, i poslužite. Možete dodati još malo jogurta u svaki tanjur. Uz juhu po želji poslužite popržene kockice kruha: narežite kruh na kockice i popržite u tavi sa sasvim malo ulja, miješajući, dok kockice ne postanu krokantne. L'ho postata l'anno scorso e la faccio stasera , bunissima!!!! Stai arrivando a Palermo????????? Dimmi quando e dove e io ci sarò! Juha izvrsno ozgleda, divna boja, ovo sa jogurtom mi se sviđa :).Kako obožavam tikvice na sve načine vjerujem da bi mi se i juhica jednako kao i tvojim curama svidjela. Ovo ljeto nije neobično kada te ulovi provala kiše na putu , stalno negdje nailaze neki pljuskovi i to takvi da doslovno plivamo u vodi, a sutra dan je jednako sunčano i vruće kao da se ništa nije dogodilo. 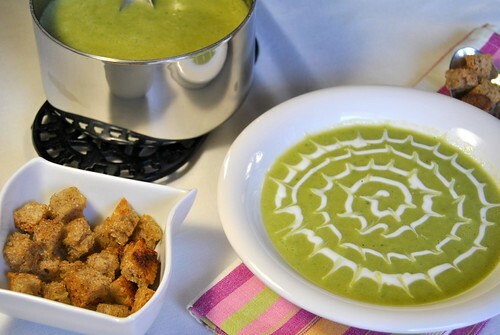 Dajana, I love your zucchini soup! Bookmarked the recipe to try! Il verde della crema è così rilassante! Sana, leggera e pure bella! I smiled at the giant zucchinis. This is a summer vegetable that just keeps on giving all season. I like the way you used it in this soup. Very creative. 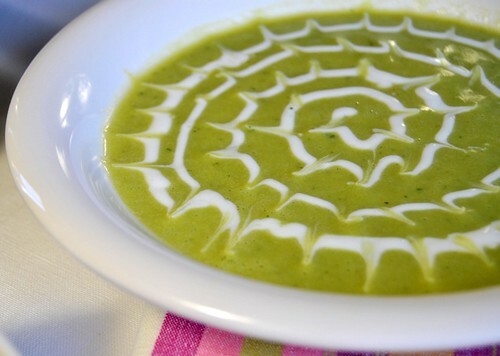 Maybe, I can get my son to eat more vegetables with this soup. Must try it. Enjoy your time on vacation. I hope that the sun will brightly shine the rest of your journey. Che buone le zuppe fredde!!! questa dev'esser deliziosa davvero... sana e rinfrescante! segnata! super juhica! ima divnu boju. sviđa mi se što si vrhnje zamijenila jogurto, moram probati! Love this summer food. Zucchini is so versital like apples or pumpkins. Buonissima! Adoro le zuppe fredde! Dajana, you are an angel for posting a new recipe for using zucchini. you're right they get huge and mine are monsters now with nowhere to go. but now i know what to use them for . . . this gorgeous soup of yours. I hope that you are enjoying your holiday/vacation. I also need to ask you if you'd be so kind as to be interviewed for my 3rd fabulous foodie friend guest interview post at either the end of August or the very beginning of September? Today you can see the results of my 2nd interview, and in june you can see the results of my 3rd interview. If you'd like to do this, I would like you to translate your responses in English to Italian as well for your blog readers who speak Italian. Please let me know when you have a moment.